I wanted to share this mini project I did for one of the YMCA's in my town. The Y is going through phases to update the building but since they are always open, they are tackling projects one at a time. 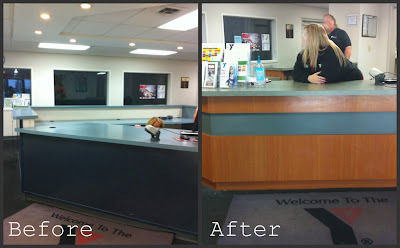 We just finished installing them a new reception desk that works much better for them functionally and updates their look. Great job - the wood really warms up the place. It was a much-needed upgrade! I didn't know you had worked on the Y.